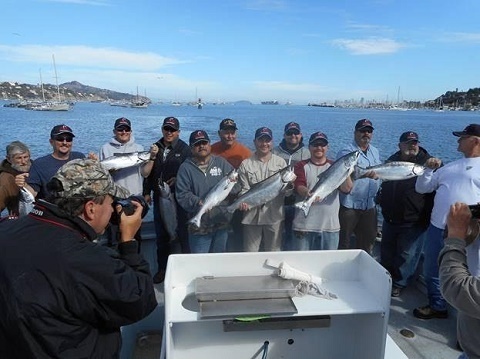 Twelve military veterans experienced a day of salmon fishing aboard the charter boat Salty Lady Monday, September 26 on a trip out of Sausalito. Nine salmon decided to go for the ultimate boat ride and made their way onto the boat after biting baits prepared by the expert crew. In the end, the fish was divided and everyone went home with salmon. The 12 vets hailed from all branches of the armed forces and spanned generations from Viet Nam vets to veterans of Afghanistan in recent years. The trip was organized by the nonprofit Field of Dreams, which works to get veterans outdoors to hunt and fish. Field of Dreams was helped by Rick Bullockof A to Z Productions and the Golden Gate Salmon Association (GGSA), which approached Bullock about putting such a trip together. Captain Roger Thomas, owner operator of the Salty Lady, ran the trip. Thomas is also the chairman of GGSA and president of the Golden Gate Fishermen’s Association, a group representing charter boat operators. The group started the day fishing offshore of Bolinas near the Duxbury buoy but later moved to the ship channel to finish the day. The wind came up around noon and the boat returned in the afternoon with 20 to 25 knots of northwest breeze at the stern. All of the fish caught were of commercial grade as adult salmon are currently massing outside the Golden Gate before making the dash into the bay and up the Central Valley rivers where they were born. Soon they’ll spawn and die leaving behind fertilized salmon eggs buried underwater in river gravel. The eggs will incubate for about 90 days before hatching. This presumes water temperatures will remain at or below 56 degrees, the temperature needed to hatch. The fish taken by the group are likely those released as four-inch long babies in the spring of 2014. Although some Central Valley hatcheries always transport some of their baby salmon to the bay for release, almost all were trucked in 2014 due to the drought conditions in the Central Valley. This came only after persistent advocacy by GGSA. All of 2015’s baby fall run salmon produced in Central Valley hatcheries was trucked. The added trucking won by GGSA in 2014 provided enough salmon to conduct a 2016 fishing season. Without it, many believe there would have been no 2016 ocean salmon fishing season. “GGSA is very grateful to the vets for their service and we’re thrilled to see them get out on the ocean for a day’s salmon fishing. We’re also extremely grateful to Captain Roger Thomas for making the Salty Lady available to take them,” said GGSA executive director John McManus. 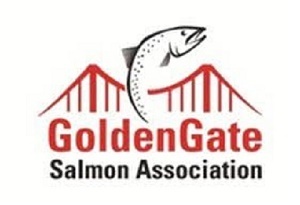 The Golden Gate Salmon Association is a coalition of salmon advocates that includes commercial and recreational salmon fisherman, businesses, restaurants, a native tribe, environmentalists, elected officials, families and communities that rely on salmon. GGSA’s mission is to protect and restore California’s largest salmon producing habitat comprised of the Central Valley river’s that feed the Bay-Delta ecosystem and the communities that rely on salmon as a long-term, sustainable, commercial, recreational and cultural resource. Currently, California’s salmon industry is valued at $1.4 billion in economic activity annually and about half that much in economic activity and jobs again in Oregon. The industry employs tens of thousands of people from Santa Barbara to northern Oregon. This is a huge economic bloc made up of commercial fishermen, recreational fishermen (fresh and salt water), fish processors, marinas, coastal communities, equipment manufacturers, the hotel and food industry, tribes, and the salmon fishing industry at large.